With a few slight modifications the beginning of this film is identical to the end of the first film. 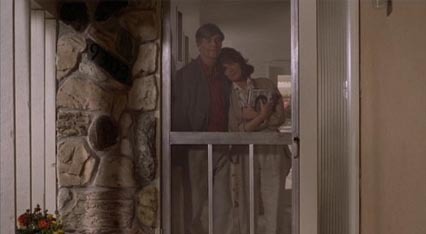 There are only a few shots from the first film inserted into this scene, this was also the most suitable place to begin the movie, because it begins where the first film left off. The actress that plays Jennifer is the second film is Elizabeth Shue, the actress from the original Back to the future is Claudia Wells, Wells could not be in this movie for personal reasons. One of the differences from the first film is that Michael J. Fox now appears to be older, this was of course unavoidable, but noticable nontheless. The license on Marty's Truck is 2BAK860. Also, in the first film he doesnt actually hit the truck with his hand, or maybe he does but you don't hear it. Jennifer: How about a ride, Mister? Marty: Jennifer, oh are you a sight for sore eyes. Let me look at you. 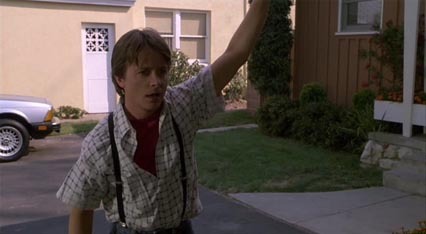 Jennifer: Marty, you're acting like you haven't seen me in a week. Jennifer: You okay? Is everything all right? 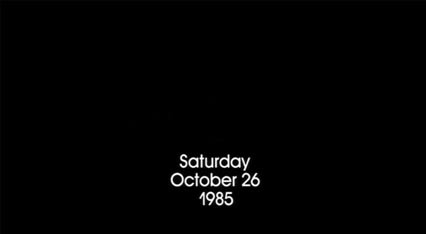 Crispin Glover does not appear in the film, but does make a "cameo" appearance here, this was an appearance that he later sued over. Marty: Oh yeah, everything is great. Doc: Marty! You've gotta come back with me! 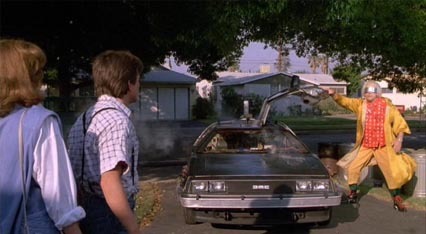 Marty: Wait a minute, what are you doing, Doc? This shot was taken from the first film and inserted into this scene to avoid further filming. 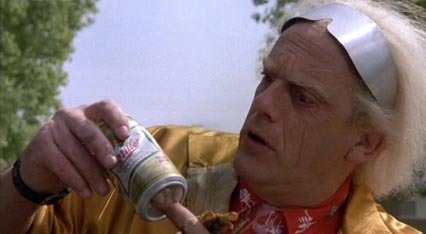 The can that Doc has in his hands is most likely from the dinner that the McFly's had the night before. 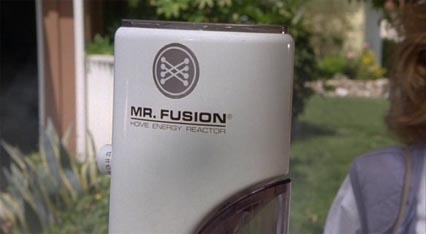 The Plutonium Chamber has now been replaced with the Mr. Fusion which is powered by garbage. The Mr. Fusion was originally a Krups "Coffina" Coffee Grinder Model 223-A. Doc: Go ahead, quick, get in the car. 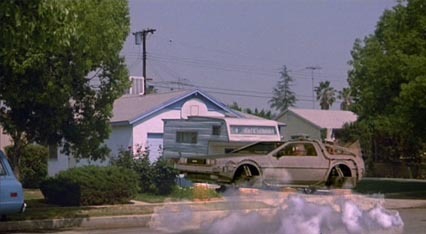 Marty: No, no, no, Doc, I just got here, okay? Jennifer's here, we're gonna take the new truck for a spin. Doc: Well, bring her along. This concerns her too. Marty: Wait a minute, Doc. What are you talking about? What happens to us in the future? What do we become assholes or something? 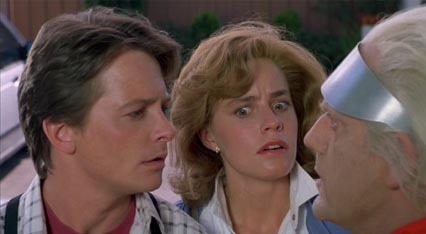 When Marty asks Doc if he and Jennifer become assholes, Doc takes a momentary pause to think, this is something that doesn't occur in the first film. It's an added touch to imply Doc's views as "Yeah, but..". 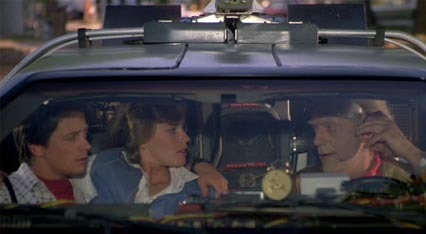 Doc: No, no, no, no, no, Marty, both you and Jennifer turn out fine. It's your kids, Marty, something has got to be done about your kids! 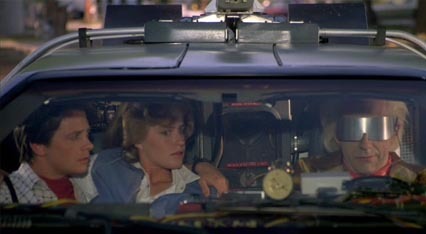 Marty: Hey, Doc, we better back up, we don't have enough road to get up to 88. Doc: Roads? Where we're going we don't need roads. This scene does not appear in the first film, it was added to give plot points for later in the film. Biff: Say Marty! 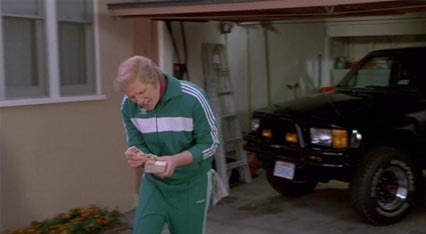 Marty, Marty I wanna show you these new matchbooks for my auto detailing I had printed up. 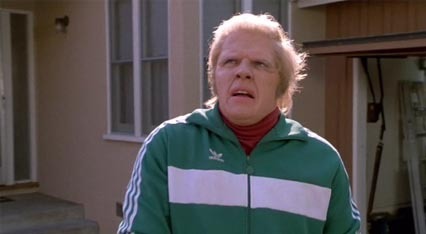 This line was used to establish that Biff knows about the DeLorean and will serve a purpose for the film once they reach 2015. Biff: What the hell is going on here?